Today one of my IG girls sent me some of her indie polishes! These are Laura Sanchez Nail Addict polishes from her new spring line. I have been following Laura since I started nail art and I actually won one of my first nail art contests through her. The first polish is Cupcake & Kittens. This polish has a sheer pink pastel base and is chock fullllllll of glitter. I don't think I've ever tried a polish that is so packed! Here is Cupcake & Kittens in three coats on the nail. Application was smooth and every brush stroke had all kinds of glitter on it. Because there is a lot of glitter you'll need a top coat to smooth and protect the polish. 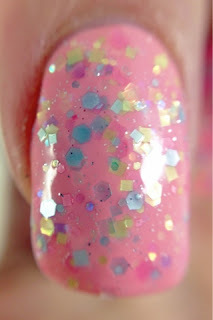 This macro shows Cupcake & Kittens in two coats over Butter London Kerfuffle. You can see there are many colors and shapes of glitter and shimmer in this polish! All are light pastel colors. I couldn't hear the name Cupcakes & Kittens and not go super sweet on my nail art! For this mani I used Butter London Kerfuffle as a peachy pink base and then used two coats of Polish Addict Cupcakes & Kittens. On the accent nail I painted a vanilla cherry cupcake! Pretty in Pastels in an equally beautiful spring color. This polish has less glitter but that doesn't make it any less gorgeous! This polish has a sheer teal base full of shimmer. The glitters spread evenly on the nail and application was very nice. Here is Pretty in Pastels on the nail in three coats. 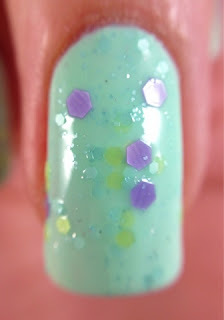 This macro shows Pretty in Pastels in two coats over Butter London Fiver. Small hex glitters in yellow and blue remind me of Easter eggs and they are set off by the larger violet hex glitters. The colors together are very complementary! 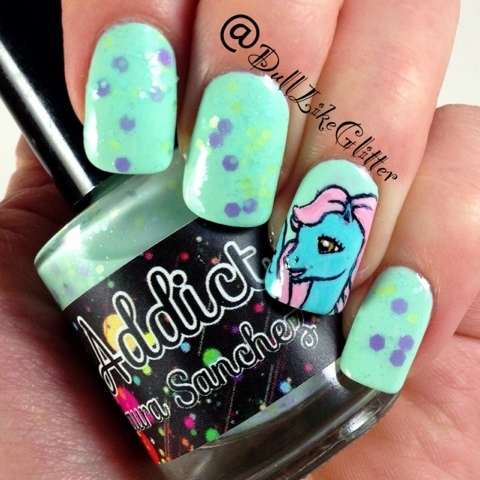 For my nail art the blue pastel color reminded me of one of my favorite TV shows as a kid, My Little Ponies! I slapped Windwhister on the ring finger, she looks like she's loving this polish too. Pretty in Pastels in on the other fingers in two coats over Butter London Fiver. Overall Polish Addict has some really beautiful spring colors here! 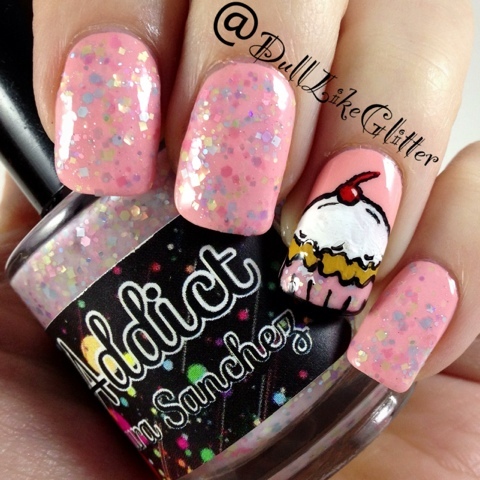 Cupcakes & Kittens applied beautifully and is chock full of glitter. You will need a nice glitter topper clear coat to seal all the glitter in on this one. Pretty in Pastels is perfect on its own! The application was great and I had no problems picking up all the glitters on the brush for application. These polishes would look great on their own or topped over other colors making them very versatile. Please note this polish was sent to me for review and is based on my honest, individual opinion.